Karnes County is a county located in the US state of Texas. As of 2000, the population was 15,446. Its county seat is Karnes City. Karnes County is named for Henry Karnes, a soldier in the Texas Revolution. According to the US Census Bureau, the county has a total area of 754 square miles (1,952 km²), of which 750 square miles (1,943 km²) is land and 3 square miles (8 km²) (0.43%) is water. In 2009 the population was estimated to be 15,029. Karnes County is surrounded by seven counties: Wilson, Gonzales, Atascosa, DeWitt, Live Oak, Bee and Goliad. 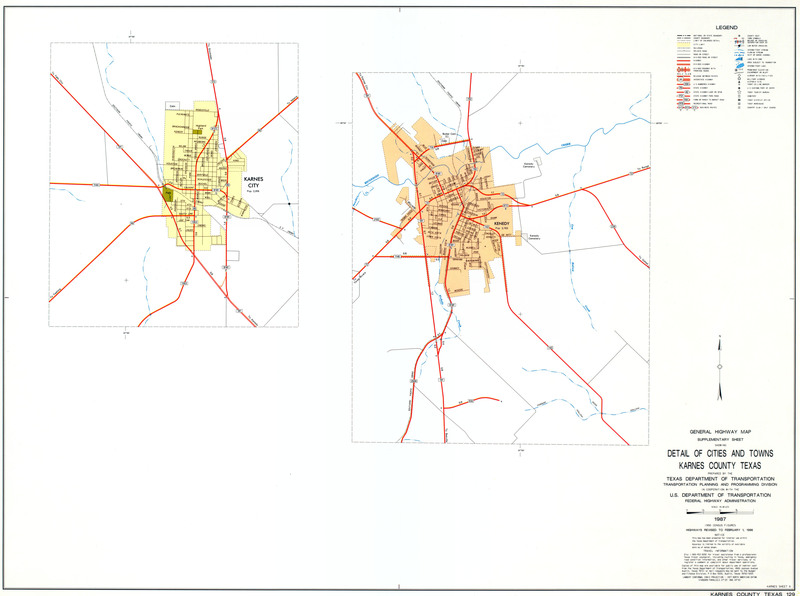 Bexar should also be considered as the Karnes County was formed from the southeastern part of Bexar. Alamita (active) – Alamita, a small Mexican settlement at the crossing of the La Bahía Road and Alamita Creek in Karnes County. Bainville (active) – Bainville, on State Highway 72 seven miles southwest of Kenedy in southwest Karnes County, was named after J. L. Bain, who built a store and a cotton gin there in the 1920s. Populated mostly by Swedes in the 1940s and 1960s, the town today consists of a church and a few farms. Burnell (inactive) – Burnell, on Farm Road 743 east of U.S. Highway 181 in extreme southern Karnes County, was a rural community that developed for cotton farming in the early 1900s. It is now just a name. Cestohowa (active) – Cestohowa (originally Czestochowa) is on Farm Road 3191 and Cibolo Creek a mile west of State Highway 123 in northern Karnes County. It is considered to be the daughter of Panna Maria and is still largely populated by Polish people. Choate (active) – Choate is seven miles southeast of Kenedy in southeastern Karnes County. The population in 2000 was twenty. Couch (active) – Couch is on the north bank of Hondo Creek off State Highway 239 seven miles southeast of Kenedy in southeastern Karnes County. The population in 2000 was ten. Coy City (active) – Coy City, also known as Appleville, is on Farm Road 99 some ten miles west of Karnes City in western Karnes County. In 1990 the community reported a population of thirty and only the Baptist church and a small cluster of residences remained. Deweesville (active) – Deweesville is on Farm Road 1344 ten miles southwest of Falls City in Karnes County. In 2000 the population was twelve. Ecleto (active) – Ecleto is at the intersection of Farm Road 627 and Dry Ecleto Creek, about six miles southeast of Gillett in northern Karnes County. In 2000 the population was twenty-two. El Oso (active) – El Oso is on Farm Road 626 a mile north of Zunkerville in the southwestern corner of Karnes County. In 2000 the population was thirty-five. Elm (inactive) – Elm, also called Seale’s Chapel, in the extreme northeastern corner of Karnes County, was named for nearby Elm Creek. It is now just a cemetery. Falls City (active) – Falls City, a mile southeast of the Wilson county line and seven miles northwest of Karnes City in northern Karnes County, owes its development to the railroad. In 2000 the population was 591. Flaccus (inactive) – Flaccus, five miles east of Helena in Karnes County, was the center of a colony of blacks who lived along McTennel Creek. In 1990 only a few wooden houses and some graves remained at the site. Gillett (active) – Gillett is at the intersection of State highways 80 and 119, sixteen miles north of Karnes City in northern Karnes County. Gillett reported a population of 120 in 1990 and again in 2000. Green (active) – Green was on U.S. Highway 181 six miles south of Kenedy in southern Karnes County. The population in 2000 was very small. Harmony (active) – Harmony, 7½ miles north of Helena on Farm Road 627 in Karnes County. Helena (active) – Helena is near the intersection of State Highway 80 and Farm Road 81, on the east side of a bend of the San Antonio River in Karnes County. It was originally the county seat. According to local legend, Helena was “the toughest town on earth”. In 2000 Helena had a population of thirty-five. Hobson (active) – Hobson is on U.S. Highway 181 and Farm Road 81 near Indian Crossing on the San Antonio River, 3½ miles south of Falls City in Karnes County. In 2000 there were eight businesses with a population of 135. Home Place (inactive) – Home Place was possibly located on lower Escondido Creek in Karnes County. Home Valley (inactive) – Home Valley was probably near what is now Falls City in Karnes County. Karnes City (active) – Karnes City, the county seat of Karnes County since 1894, is at the intersection of U.S. Highway 181 and State highways 80 and 123, in the central part of the county some fifty miles southeast of San Antonio. In 2000 the population was 3,457. Kenedy (active) – Kenedy is on U.S. Highway 181 and State Highway 72 four miles south of Karnes City in southwestern Karnes County. In 2000 Kenedy contained 209 businesses and 3,487 inhabitants. Lenz (active) – Lenz, on Farm Road 626 eight miles west of Kenedy in Karnes County, was settled in the early 1890s by German farmers from Fayette County. The population was listed at twenty in 2000. Marcelina (active) – Marcelina is one mile south of the site of present Falls City in Karnes County. Mound Creek (active) – Mound Creek was a community on a dirt road eight miles southeast of Gillett in northeastern Karnes County. In 1990 only a cemetery and a few scattered farms and ranches remained in the area. New Bremen (inactive) – New Bremen is on Farm Road 626 five miles southwest of Karnes City. Only a cemetery and the shell of its last school remained in 1990. Nicaragua (inactive) – Nicaragua was situated at the intersection of the old road leading east from Wofford Crossing and the San Antonio-Goliad Road, about two miles south of Helena in Karnes County. Nockernut (active) – Nockenut is on Farm Road 1681 twenty miles northeast of Floresville in northeastern Wilson County. In 1990 through 2000 the reported population was ten. Overby (inactive) – Overby is located near the head of Live Oak Creek on Farm Road 743 in southern Karnes County. Panna Maria (active) – Panna Maria is on a plateau near the junction of the San Antonio River and Cibolo Creek where Farm roads 81 and 2724 meet, four miles north of Karnes City and fifty-five miles southeast of San Antonio in central Karnes County. It claims distinction as the oldest permanent Polish settlement in America and as the home of the nation’s oldest Polish church and school. Through 2000 the community’s population was still estimated at ninety-six. Pawelekville (active) – Pawelekville is on an unnumbered road east of State Highway 123 in northern Karnes County. In 2000 the population was estimated as 105. Radford (inactive) – Radford is in northeastern Karnes County. Ruby (inactive) – Ruby was a switch on the Texas and New Orleans Railroad in western Karnes County. Runge (active) – Runge is at the junction of State Highway 72 and four farm roads, east of the San Antonio River, three miles west of the DeWitt county line, and nine miles east of Kenedy in southeastern Karnes County. In 2000 the population was 1,080. Wintergreen (inactive) – Wintergreen, a ghost town in northeastern Karnes County, was situated at the intersection of the Victoria-San Antonio and the lower Helena-Gonzales roads. Zunkerville (active) – Zunkerville is located on State Highway 72 twelve miles west of Kenedy in the southwestern corner of Karnes County. In 2000, the population was fifteen. 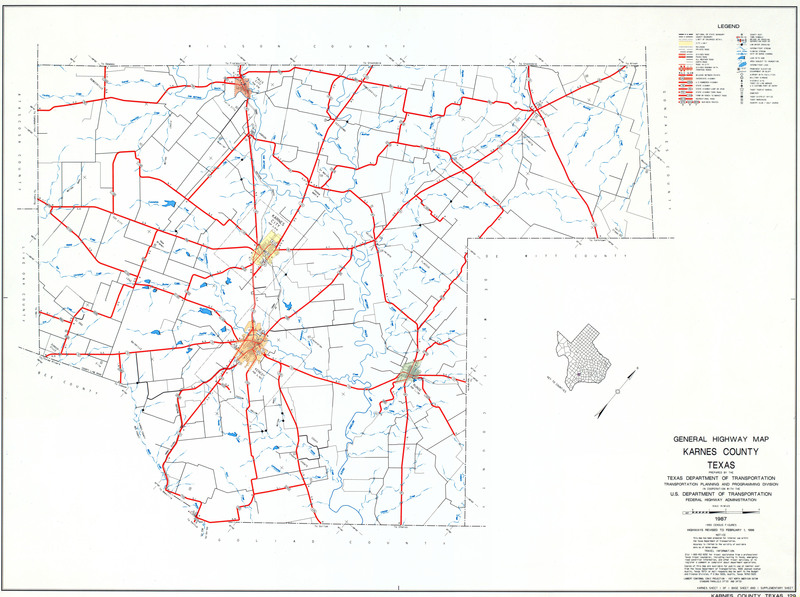 The current highway map of Karnes County and other Texas counties can be found at the Texas Department of Transportation. There are highway maps at The University of Texas Library that are kept for historical reasons. These maps were published from 1993 – 1996. The Center for Archaeological Research (CAR) was established in 1974 to: conduct archaeological research throughout Texas and the surrounding regions; carry out archaeological surveys and excavations for federal, state, and local agencies as required by legislation and executive order; provide public and private sector assistance and guidance regarding cultural resource management; provide students training opportunities in archaeological field and laboratory methods and technical writing; and disseminate to the general public information about the prehistory and history of Texas and San Antonio. The Center for Archaeological Research Publications Collection includes 440 digitized publications created by the University of Texas at San Antonio’s Center for Archaeological Research between 1974-2010. Includes records of the District and County Courts. Microfilm of original records in the Karnes County courthouse, Karnes City, Texas. A book about El Furerte de Cíbolo, an 18th century Spanish fort in the middle of the ninety-mile-long Alamo-La Bahía Corridor. The soldiers stationed there were to protect the Béxar-La Bahía ranges and ranchers of the region. The author combines archeology and historical records to desribe the history of the fort as an outpost of the Spanish Empire. Illustrated with black and white photographs, maps, and reproductions as well as black and white drawings and the dust jacket illustration by Jack Jackson. Microfilm made from original records in the Karnes County Courthouse. From 1870-1876 probate matters were handled by the district court. Billy Royce Linder was born in 1937 in Kenedy, Texas, to Royce Holden Linder and Maxine Kathryn Yeater. In 1963 he married Nancy Kathryn James, daughter of Virgil Albert James and Frances Rae Stephens. They had 5 children. Bill R. Linder’s great grandmother was Jemima Catherine Murphree (1861-1941). Her earliest known Murphree ancestor was Daniel Murphree. In 1743 he purchased land in Bertie County, North Carolina. His wife was Sarah and they had 13 children. Descendants have lived in North Carolina, South Carolina, Alabama, Mississippi, Texas, and elsewhere. Includes related families of Yeater, Shaw, Linder, Montagnoli, Hintze, Steuer, Cox, Jones, Grunewald, Votaw, Davis, Rogers, Vine, Reagan, Pilgreen, Barton, Hellums, Vickery, Barnes, Blyth, Wimberly, Reed and others. Ancestors and descendants of Ida Taylor (1871-1949), daughter of Francis Marion (Frank) Taylor and Martha Jane (Mattie) Starnes. She was born at Creek, Houston Co., Texas. In 1888 at Lovelady, Houston Co., Texas, she married Christopher Tatum (Kit) Linder (1857-1935), son of Lewis Linder and Catherine Gavin Tatum. He was born in Jasper Co., Mississippi. Both died near Kenedy, Karnes Co., Texas. They were parents of thirteen children. Descendants in this book are through their youngest child, Royce Holden Linder born 1916 in Kenedy, married 1936 Maxine Kathryn Yeater. The early Taylor ancestor, Rev. William Taylor (ca. 1750-1829) of Johnston, North Carolina, married Sarah Sanders (b. ca 1756), daughter of John Sanders and Mary Tully. Family moved from Johnston County to Anson County, N.C. ca. 1798/99. They were parents of seven children all probably born in Johnston Co., N.C.